Apple has a long relationship with Adobe. In fact, we met Adobeâ€™s founders when they were in their proverbial garage. Apple was their first big customer, adopting their Postscript language for our new Laserwriter printer. Apple invested in Adobe and owned around 20% of the company for many years. The two companies worked closely together to pioneer desktop publishing and there were many good times. Since that golden era, the companies have grown apart. Apple went through its near death experience, and Adobe was drawn to the corporate market with their Acrobat products. Today the two companies still work together to serve their joint creative customers â€“ Mac users buy around half of Adobeâ€™s Creative Suite products â€“ but beyond that there are few joint interests. Apple even creates open standards for the web. For example, Apple began with a small open source project and created WebKit, a complete open-source HTML5 rendering engine that is the heart of the Safari web browser used in all our products. WebKit has been widely adopted. Google uses it for Androidâ€™s browser, Palm uses it, Nokia uses it, and RIM (Blackberry) has announced they will use it too. Almost every smartphone web browser other than Microsoftâ€™s uses WebKit. By making its WebKit technology open, Apple has set the standard for mobile web browsers. Second, thereâ€™s the â€œfull webâ€. Adobe has repeatedly said that Apple mobile devices cannot access â€œthe full webâ€ because 75% of video on the web is in Flash. What they donâ€™t say is that almost all this video is also available in a more modern format, H.264, and viewable on iPhones, iPods and iPads. YouTube, with an estimated 40% of the webâ€™s video, shines in an app bundled on all Apple mobile devices, with the iPad offering perhaps the best YouTube discovery and viewing experience ever. Add to this video from Vimeo, Netflix, Facebook, ABC, CBS, CNN, MSNBC, Fox News, ESPN, NPR, Time, The New York Times, The Wall Street Journal, Sports Illustrated, People, National Geographic, and many, many others. iPhone, iPod and iPad users arenâ€™t missing much video. Third, thereâ€™s reliability, security and performance. Symantec recently highlighted Flash for having one of the worst security records in 2009. We also know first hand that Flash is the number one reason Macs crash. We have been working with Adobe to fix these problems, but they have persisted for several years now. We donâ€™t want to reduce the reliability and security of our iPhones, iPods and iPads by adding Flash. In addition, Flash has not performed well on mobile devices. We have routinely asked Adobe to show us Flash performing well on a mobile device, any mobile device, for a few years now. We have never seen it. Adobe publicly said that Flash would ship on a smartphone in early 2009, then the second half of 2009, then the first half of 2010, and now they say the second half of 2010. We think it will eventually ship, but weâ€™re glad we didnâ€™t hold our breath. Who knows how it will perform? To achieve long battery life when playing video, mobile devices must decode the video in hardware; decoding it in software uses too much power. Many of the chips used in modern mobile devices contain a decoder called H.264 â€“ an industry standard that is used in every Blu-ray DVD player and has been adopted by Apple, Google (YouTube), Vimeo, Netflix and many other companies. When websites re-encode their videos using H.264, they can offer them without using Flash at all. They play perfectly in browsers like Appleâ€™s Safari and Googleâ€™s Chrome without any plugins whatsoever, and look great on iPhones, iPods and iPads. 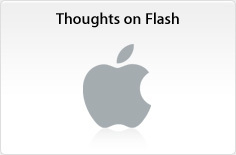 Besides the fact that Flash is closed and proprietary, has major technical drawbacks, and doesnâ€™t support touch based devices, there is an even more important reason we do not allow Flash on iPhones, iPods and iPads. We have discussed the downsides of using Flash to play video and interactive content from websites, but Adobe also wants developers to adopt Flash to create apps that run on our mobile devices. This becomes even worse if the third party is supplying a cross platform development tool. The third party may not adopt enhancements from one platform unless they are available on all of their supported platforms. Hence developers only have access to the lowest common denominator set of features. Again, we cannot accept an outcome where developers are blocked from using our innovations and enhancements because they are not available on our competitorâ€™s platforms. Flash is a cross platform development tool. It is not Adobeâ€™s goal to help developers write the best iPhone, iPod and iPad apps. It is their goal to help developers write cross platform apps. And Adobe has been painfully slow to adopt enhancements to Appleâ€™s platforms. For example, although Mac OS X has been shipping for almost 10 years now, Adobe just adopted it fully (Cocoa) two weeks ago when they shipped CS5. Adobe was the last major third party developer to fully adopt Mac OS X. Our motivation is simple â€“ we want to provide the most advanced and innovative platform to our developers, and we want them to stand directly on the shoulders of this platform and create the best apps the world has ever seen. We want to continually enhance the platform so developers can create even more amazing, powerful, fun and useful applications. Everyone wins â€“ we sell more devices because we have the best apps, developers reach a wider and wider audience and customer base, and users are continually delighted by the best and broadest selection of apps on any platform.